The popular and inexpensive Raspberry Pi1) tiny PC offers some interesting I/O like I2C and GPIO. Because the I2C bus is a common and standard one, the idea to use it for Model Railway automation was born in 2013. Together with Peter Giling, who lives in the Netherlands, we have developed a range of modules for use with Model Railways. In September 2011, before the Raspberry Pi was released, one forum member mentioned that the Raspberry Pi might make for a Rocrail server that would fit under the layout. Little did anyone realize just how popular, powerful, and flexible the Raspberry Pi would be. In May of 2013 experimentation was done using a variety of communication methods. In May of 2003 the first mention of Rocnet as a way communication between the PC and a Raspberry Pi occurred. In August of 2013 the first version of a Rocnet client on the Raspberry was created. It was a simple port expansion device. Simple, robust, and easy to implement, it was a near perfect solution….and inexpensive too. Next came the servo/LED controller, then the other modules. Various forum members also tried a variety of TCP/IP protocols like SRCP (1). While SRCP is certainly one possibility, it lacks plug-and-play capabilities as it is TCP/IP socket (2) based. Rocnet, which is Multicast based, is plug-and-play. While this was occurring, various other experiments were conducted by Peter and others. A variety of I2C (3) peripheral devices were tried for various functions. Some were successful, some less so. One fact became increasingly clear as a result of these experiments. The Raspberry Pi (and its I2C bus) is a stable, robust and very capable platform. The very best of these prototypes resulted in modules available from GCA (= Giling Computer Applications). In retrospect the Linux based Raspberry have proven to be more than just a simple controller for model railways. Coupled with Rocrail/Rocnet it becomes what some call a Super-Controller. (2) TCP/IP socket communications requires that the IP address of the remote node be known before communications can start. To resolve this issue, IP-Multicast is used so that remote node communications can occur without prior knowledge of the destination IP address. (3) I2C = IIC = Inter Integrated Circuit. This hardware based communication protocoll , originated by Philips, is a 2 wire communication system between chips on the ame board. Later improvements and speed-up, together with availability of bus transcievers and buffers like used in the RocNet modules, made it possible to extend the communication lines to more than 10 meter. The whole system is kind of like 'Plug&Play' but it needs an Ethernet Local Area Network in which IP-Multicast is not blocked by a firewall. An Internet gateway is only necessary for updating the Rocnetnode software. The DHCP-Switch ( a small box used to interconnect TC/IP devices) is responsible for assigning IP addresses to the RasPi's and Rocrail. The large setup example is especially interesting for modular layout like my own 'Plan-F': http://wiki.rocrail.net/doku.php?id=plan-f:plan-f-en. 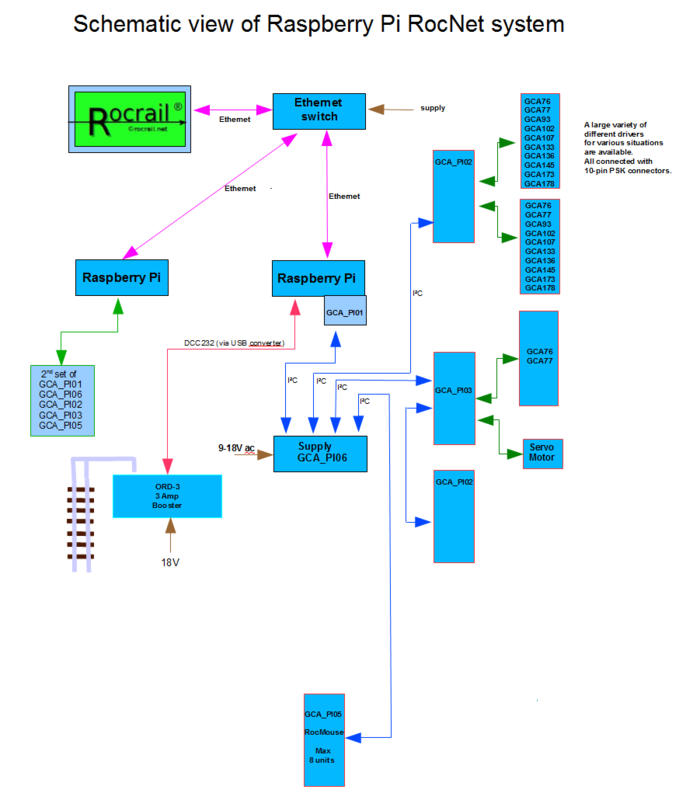 The Rocrail project has developed a protocol based on IP-Multicast Ethernet communication which was chosen for this RasPi solution. The Rocnetnode is the software part running on the RasPi and will manage I/O, Servos and throttles. All hardware modules are I2C based and do not need any firmware; Rocnetnode handles it all. Pi01 The main module which connects directly on the RasPi GPIO header. Pi02 32 port I/O module which is compatible with all GCA interface modules: http://wiki.rocrail.net/doku.php?id=english#interfaces. Pi03 16 port PWM module for controlling servos. It's an adapter for the Adafruit PCA9685 PWM controller. Pi04 A hand-held throttle with 28 functions. Pi07 Zero loss occupancy detection which can handle low and high current for large scale locos. All modules have I2C line drivers to make long cables possible. You can choose between RJ45(CAT) and RJ12(LocoNet) connector types. I personally prefer RJ12 because this type is easy to assemble yourself with very flexible cable, and it cannot be accidentally swapped with the RJ45 Ethernet cables. The Pi01 connects on the RasPi GPIO header and serves also as a power supply when connected to the Pi06. The board offers two LEDs and one button. The green LED starts to blink if Rocnetnode has been started. The red LED is used for identification when requested by Rocrail, which is very useful in the case of a large setup. A short push on the button will identify this Rocnetnode to Rocrail and will popup the configuration utility with this node selected. A long push of several seconds duration will shutdown this RasPi as indicated by fast blinking of the green LED. It is not necessary to shutdown the RasPi because the configuration is saved on the SD-Card. But for those who will get a bad conscience when pulling the power supply plug of a Raspberry Pi, the shutdown(all) option is available in some variations. The list of compatible interfaces for the Pi02 is long and is documented here: http://wiki.rocrail.net/doku.php?id=english#interfaces. LEDs or other low power consuming parts can be connected directly with the needed resistor. Also push buttons can be connected directly to be able to create a CTC. The Pi03 uses the Adafruit PCA9685 PWM controller as piggyback because the footprint of the chip is for our techniques too small. An alternative would have been to let the chip be mounted directly on the professional board but this investment would not fit in our hobby budget. This throttle, also called 'Rocmouse', is Command Station independent and has the look and feel of a FREMO Fredi. The commandos are scanned by Rocnetnode running on the RasPi and are forwarded to Rocrail. Rocrail will dispatch the received commands to the configured Command Station in its own native protocol like Xpressnet for example. It can be hot plugged in any free I2C connector. 28 functions divided in groups of 4. The group number is represented as binary number by the LEDs above the buttons. Up to 8 connected on one RocNetNode. The Pi06 serves as power supply for all modules and the RasPi. It also is a concentrator for the I2C bus. It has only four connectors but all modules can be daisy chained in sequence. The project was started using common 5V USB power supplies but that solution has been dropped because of the bad quality of those units and never delivered the promised 5V. The Pi06 made the project more accepted by avoiding many unwanted 5V adapters. The original idea came from Richard Andrews (Texas). Peter and I did not take it very serious at start but Richards experiments came to a good useable result. After prototyping by Peter we added this to the Pi line of hardware. Only one 16V AC 70VA transformer is needed for the whole 'Plan-F' setup. The small Ethernet Switch is a low budget one for less the €10 which can be daisy chained from one layout module to the other. For configuring the Rocnetnode options, I/O and Servos there is a very advanced utility in Rocrail in which every detail can be viewed and set. Index A list of automatically registered Rocnetnodes. RocNet A tree view of all nodes with the basic settings. Options Defines which hardware is connected; Even the SPROG can be included. Pi02 Port Setup I/O configuration. Pi03 Channel Setup Servo and/or PWM configuration. Macro Especially for signal system with more then 4 aspects. Update On the fly update the Rocnetnode software. See for detailed information: http://wiki.rocrail.net/doku.php?id=rocnet:rocnetnode-setup-en. Professional boards and kits can be ordered at the Web site of Peter Giling : http://www.phgiling.net/. Also a pre-configured SD-Card or Micro Sd-Card with installed Raspbian and Rocnetnode is available in combination with an order. The support of Rocrail and all related Hardware is covered by a very good Forum with many good Moderators. Because the Raspberry Pi OS is Open Source, the Rocrail/Rocnet system is easily added to or modified. A sound client is one idea by using the audio output of the RasPi.